Hello Rainy Sunday! I am happy that it's raining because it means that it'll be less hot in Manila. Just this morning I just registered my subjects for this semester. I think summer days will pass faster now. This bb cream has the thickest texture among the bb creams that I tried. The color is whitish purple with really really small particles which changes into the color of skin your tone after blending. I must agree with the thoughts of other bloggers that the concept of the product is quite gimmicky, because how can the purple tone of the bb cream correct the yellowness of your skin when the color changes when it is blended? Oh well~ nonetheless I still like this product. Because texture is thick, a little product goes a long way, awesome! Going back, Lioele Dollish veil has this floral kinda soapy scent which I love. Its a really light scent which is pleasant. I usually use this alone or on top of my moisturizer. It doesn't really spread easily so you need to have a properly moisturized face prior to the usage of this product. Yes I've also tried this as a make-up base for my bb cream but unfortunately it feels heavy for my taste. The finish of Lioele Dollish Veil Vita BB is matte, it's perfect for the humid weather like this summer. It has SPF 25 PA ++ and I think it can be a good as a substitute for sunblock but the moisturizer I use contains SPF as well. One application instantly brightens up my complexion but maybe it's also because of the fact that it is lighter than my skin tone. I don't see the need for concealer because of the coverage, it doesn't completely cover my dark spots and redness but it makes them less noticeable. I also don't get oily thanks to the formula and the product's matte finish. My pores aren't covered well unlike with other bb creams with dewy or satin finish. Topping off this bb cream with finishing powder (although optional since finish is already matte) makes a difference though. I didn't experienced skin break outs nor whiteheads and blackheads, which I happen to get every time I use bb creams. The product stays the whole day although I still need to check on my oily nose once in a while. The final look of this bb cream alone is next to natural, it's just like having a lighter skin tone or you can also call it your second skin. A make-up that doesn't look like make-up. Amaaaazing! Matte finish doesn't make me oily. Does it job as it brightens skin instantly. Perfect bb cream for natural look. It doesn't blur out pores unlike other bb creams. 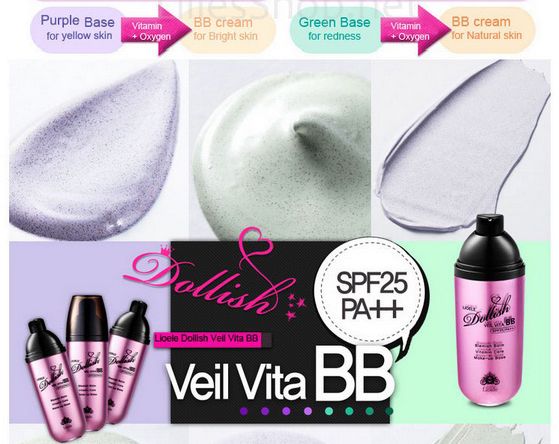 Lioele Dollish Veil Vita BB Gorgeous Purple is a nice addition to my kikay kit but I would love to get the green variant next. I highly recommend having one bottle in your stash though, it is a must-have for bad skin days or when you just feel like brightening up. CREDITS: To Lioeleph for the image.